As NFL players prepare to report to training camp (if they already haven’t), fans and the media don’t have much to talk about. With no news of note to discuss, fans and the media are left with speculation to fill the void. You know, things like who’s going to win it all, who’s going to win what award, and which head coach is going to get fired first. While it isn’t hard to see some guys have better odds than others, don’t count on the first to go being one of the frontrunners. According to Betway.com (as of July 22), Dirk Koetter (Buccaneers) will be the first to go (5/2). Following him is Hue Jackson (Browns; 5/1), Vance Joseph (Broncos; 13/2), and Adam Gase (Dolphins; 15/2). Lewis’s longevity is probably what keeps his odds from being worse than they are. He’s currently tied with Jim Mora for most seasons as a head coach without a playoff win (seven). His seven playoff losses without a single win are a record. Why should anyone think the Bengals would fire him now when they haven’t after one of his many other mediocre finishes? His best shot at winning a playoff game came in 2015. But his defense lost its cool late in the wild-card game against the Steelers. The resulting penalties made it easy for the Steelers to make a game-winning field goal. Since then, his teams have finished with sub-.500 records. There is little about the team heading into 2018 to give fans a reason to think they’ll be any better. Maintaining a better-than-average level of play is commendable (and better than losing). We all want to be great but being good is better than being bad. Under Lewis, the Bengals have been good more often than not. But they have never been better than ‘good.’ The Bengals need to accept that a Lewis-led team is never going to be more than good. There is nothing wrong with good, but good teams don’t win Super Bowls. Should the Bengals have another mediocre-to-bad season, Lewis has to go. If the front office thinks they have a candidate on staff, they need to let him go in-season. Otherwise, as soon as the season ends the ax needs to drop so the search can begin. The only thing that should save him from being the first is Cleveland getting off to a 0-8 start. After acquiring a ton of talent in the offseason, the Browns should be a better team. 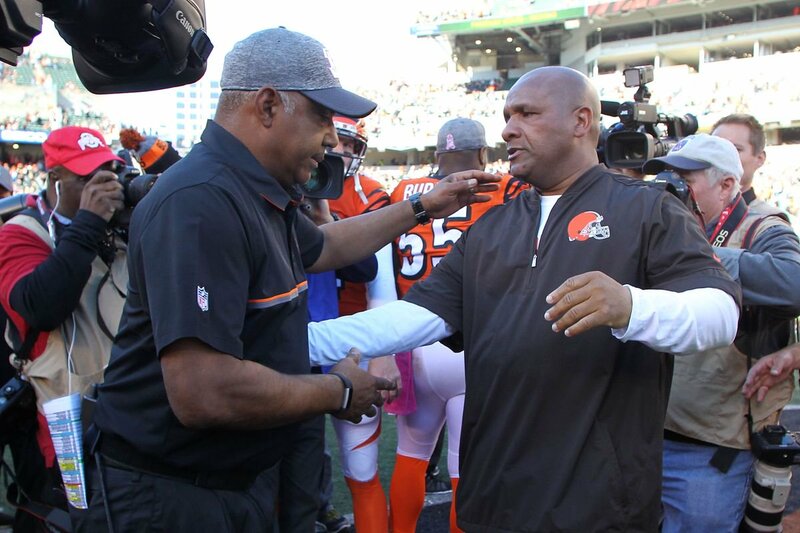 If they aren’t and the losing streak continues, the Browns will be looking for a new head coach by midseason. But a mediocre season will probably get Jackson another year.